The customs sector collected over 284.2 trillion VND (12.14 billion USD) in taxes as of November 30, a year-on-year rise of 7.27 percent. The figures were revealed by the General Department of Vietnam Customs at a press conference in Hanoi on November 5. The outcomes were attributed to the surge in import-export turnover which hit 439.96 billion USD, up 13.3 percent against the same period last year. Of which, the export earnings reached 223.76 billion USD, up 14.5 percent year-on-year. Meanwhile, the import value was 216.2 billion USD, a year-on-year rise of 12.1 percent. As of November 30, 2018, the customs sector collected and handled tax arrears worth more than 1.4 trillion VND (59.8 million USD). The department has signed cooperation agreements with 39 banks, including 24 which are piloting e-tax payment systems. As a result, by the end of November 2018, the customs sector collected over 269.9 trillion VND (11.5 billion USD) of taxes through the banking system. 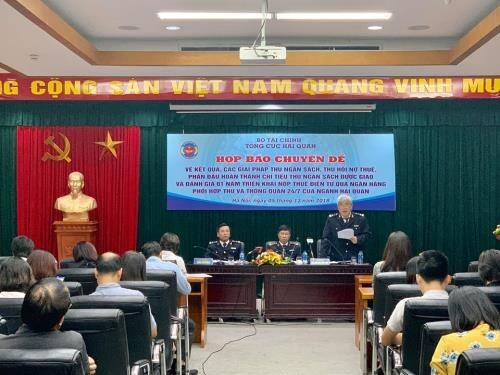 Le Manh Hung, Deputy Director of the Foreign Trade Agency under the General Department of Vietnam Customs, revealed that 3,235 businesses have so far conducted e-tax payments. The implementation of e-tax payment systems is to supplement current payment channels to facilitate enterprises making payments to the State budget, as well as to support enterprises to open more accounts at foreign banks and large businesses, he added.